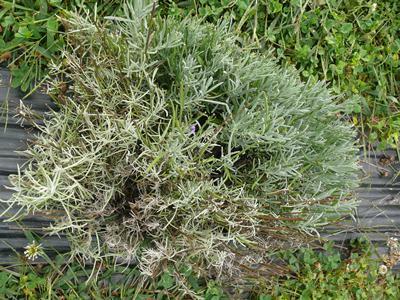 Phytophthora has shown up on scattered plants in a few lavender fields in southern Ontario. The disease is showing up even in high areas of the field, which is unusual for this disease and several different cultivars have been affected. Phytophthora root rot is a very damaging disease that will destroy plants within a week or two under very moist conditions. It can then spread down the row to neighbouring fields or spores can be washed downhill to low areas. It appears that the disease requires very moist conditions to show up in lavender fields and could be present in the soil for years before the disease shows up. Phytophthora root rot normally begins as the wilt and browning of a few branches of an individual plant (Figure 1). As the disease progresses, more of the plant wilts and eventually the whole plant dies. Neighbouring plants will often begin to show symptoms of the disease as the pathogen slowly moves through the soil. Figure 1. Phytophthora root rot has caused branches on this lavandin cultivar to collapse. Several species of Phytophthora have been found on roots of affected plants with the main species being Phytophthora nicotianae and P. cactorum. These species have a very broad host range. Phytophthoras belong to a group of fungal-like organisms called oomycetes (water moulds). They produce spore sacs called sporangia that release numerous swimming zoospores. These zoospores can swim through the water in wet soils. Movement from one plant to the next is often by direct swimming of zoospores in saturated soils. Movement from one section of the field to the next can be through splashing of infested soil, surface runoff, movement of infested soil on boots or machinery, or potentially airborne spores. For example, P. cactorum is a major disease of ginseng and it can produce airborne spores if ginseng leaf tissues become infected, but this is unlikely to be a major source of inoculum for lavender fields since foliage of lavender is not susceptible to the disease. With the wide host range of the Phytophthora species that attack lavender, the primary source of these pathogens is soil contamination from a previous crop. It is also possible for it to come into the field in contaminated transplants, or if plants are dug up in a contaminated area and moved to a new location. Once the disease shows up in a lavender field, there is nothing that can be done to rescue affected plants. Any plants with symptoms should be immediately removed. Neighbouring healthy plants on either side of the affected plant should also be removed. The field should be continuously monitored for further disease spread down the row. Avoid planting lavender back into the same spot. Consider planting non-host ornamentals instead. If plastic or fabric mulch is used for weed control, consider opening up the mulch around the unaffected plants to increase aeration around the crown. Where plants are removed, consider applying a solid sheet of plastic over the holes to prevent rainfall from splashing infested soil down the row. The disease is normally a result of excess water in the soil. Improving drainage is the best way to reduce the disease pressure. Growers should ensure that purchased plant material is free of disease. DNA-based diagnostic tests used by commercial diagnostic laboratories can detect if the pathogen is present in growing media. However, this would be expensive to do routinely. Growers should talk with propagators to see how they manage diseases in their operations and find out what warranties accompany the plants. This entry was posted in Herbs, Lavender and tagged Diseases, Lavender. Bookmark the permalink. Hi Lori. There are several diseases that can cause a whole lavender plant to die, and each has specific conditions that promote the disease. Phytophthora causes disease under very wet conditions with moderate temperatures. Under hot and dry conditions it is unlikely to cause major problems unless you are watering too frequently and/or the source of the water is contaminated. It could also damage roots at a cooler time of year and the plant doesn’t show symptoms until the plant is stressed. Fusarium can cause disease under warmer and drier conditions and does occur frequently in the greenhouse where plants are usually propagated. It seems to be more of a problem when plants are under high stress (too dry, too hot, after flowering, etc.). Fusarium is a very common soil fungus, so it could come in on the plant material or could be naturally found in your soil. I could see it being a problem if the plants had frequent shallow watering with wilting in between. You should ensure deep and thorough watering when you do water, and then wait for them to dry out a bit before watering again (but not to the point of wilting). I would advise digging up plants when they are half diseased and bringing it in for an official diagnosis with your local extension service or diagnostic lab. That way you know what you are dealing with. It is possible that if you correct whatever issue is promoting disease, that it will not come back, but it depends on the disease.